The Galanti seder wasn’t always quite so crowded, as seen in this photo from the 1948 seder at a home on Virginia Circle. 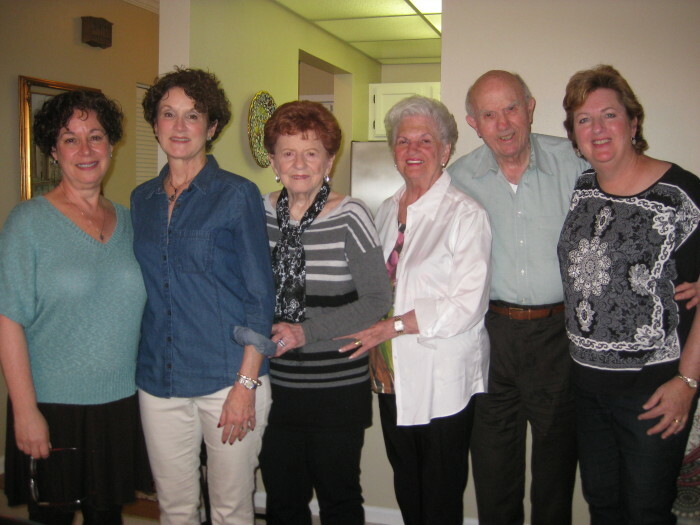 The Galanti family of Congregation Or VeShalom in Brookhaven always celebrates Passover together. The cousins are close, and the Sephardic family all wants to be together. So the Galantis have not split Passover into multiple smaller seders. It’s a Galanti family Passover tradition. 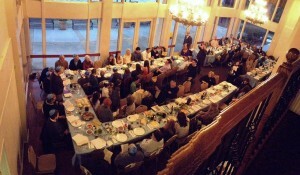 Last year the family had 93 people at the seder, and this year a record 97 people are expected. “We take pride in doing it,” said Ann Galanti of Brookhaven. Rabeno and Louisa Galanti immigrated to Atlanta from Turkey in the 1920s and began the tradition of a family Passover seder in Atlanta. The seder has grown steadily over the years as children grow up, marry and have children of their own. “It’s grown by leaps and bounds,” said Janet Galanti of Dunwoody. Years ago it was held in family members’ homes with about 60 people in attendance. Ten years ago the Galantis moved to a venue with a larger space to accommodate their big family, the Roswell River Landing. The Galantis like that the venue is centrally located and comfortable and comes with a full kitchen because they do all their own cooking. The seder clan includes (from left) Nancy Galanti, Janet Galanti, Ila Galanti, Ann Galanti, Sam R. Galanti and Helene Galanti Tuck. How do the Galantis pull off a seder with a home-cooked meal for that many people? “It’s unbelievably organized,” said Ila Galanti of Sandy Springs. Some of the intown cousins split into three smaller groups and rotate the organization of Passover every two years. They have a notebook and a spreadsheet to guide exactly what to do, including a seating chart. The Passover committee sends a save-the-date card to family members six weeks out to explain what each person should bring, but typically the same people make the same dishes every year. It takes two to three hours to set up for the seder and about an hour to clean up. The Galantis hire people to help set up the tables and to assist in the kitchen to keep the food moving. There’s no matzah ball soup or gefilte fish at the Galantis’ seder because it is a Sephardic seder with Mediterranean food. The two dishes everyone looks forward to most are the quajado, a Spanish casserole of spinach, meat and matzah meal, and the charoset, made of dates, nuts, wine and applesauce. The Galantis mainly cook out of the Or VeShalom Sisterhood cookbook. About 15 family members make all the food for Passover. 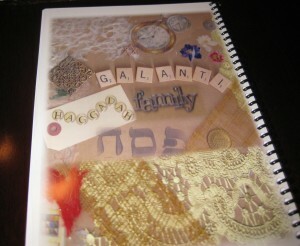 The Galantis have a new tradition of using their own custom haggadah. Before the seder, the Galantis have an outdoor cocktail hour overlooking the river if the weather is nice. They serve chopped liver, chopped herring and smoked salmon, which are dishes customary to their many Ashkenazi relatives. The family last year started using a custom-made haggadah that includes family pictures and is easier for the children to read. Everyone in attendance, even young children, takes turns reading aloud from the haggadah. All the children from age 4 to b’nai mitzvah age read the Four Questions together for the large crowd. When Passover starts on a weekend, as it does this year, more out-of-town family members are likely to come. The Galantis are expecting family from Israel and all over the United States, including Seattle, New York, Florida, St. Louis, Knoxville, Boston and San Diego. Not everyone is family. The Galantis expect about 10 friends of the family to celebrate Passover with them this year, including some college students. The Galantis all get together for the first night of Passover only. On the second night, they celebrate with their respective families in much smaller groups. The entire Galanti clan also breaks the fast after Yom Kippur together. The large family remains close, and the cousins from around the country know one another and keep in touch. This is part of the 2014 Galanti seder scene. Sam R. Galanti of Brookhaven is the youngest son of Rabeno and Louisa and the only one of their five children who is living. 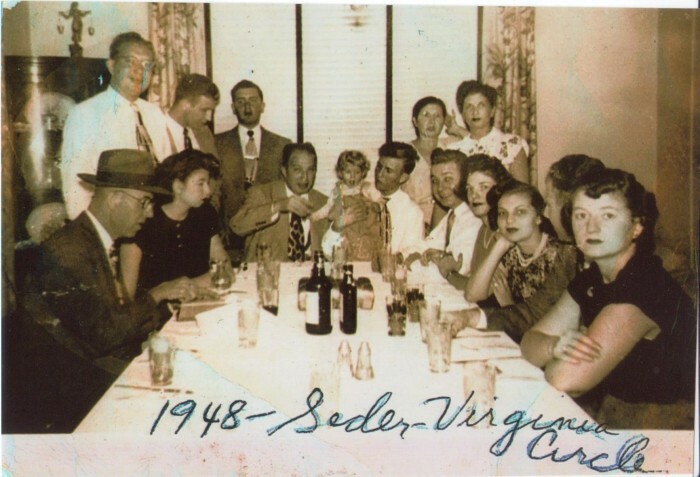 The 84-year-old will be at the seder’s head table, which is still representative of the five siblings. 1½ cases of Manischewitz wine. 2 cases of drinking wine. 12 pounds of green beans. This is the recipe of Louisa Galanti, of blessed memory. Chop nuts in a food processer (or blender). Cook dates (not too much water), stirring some, to soften for a few minutes before grinding. Drain water but use excess water in the mix. Mix applesauce with nuts. Add dates, vinegar and wine. May add more Harvey’s Bristol Cream or pale sherry wine and some Manischewitz concord grape Passover wine if desired. This recipe is from “The Sephardic Cooks, Come con Gana” by the Congregation Or VeShalom Sisterhood, available from the Or VeShalom gift shop. Brown the meat in the oil, and add salt and pepper. Add the matzahs, spinach and broth to the cooled meat mixture and mix well. Add the beaten eggs and mix well. Bake in a greased, heated 9-by-13-inch pan at 375 degree for 30 to 45 minutes. You can add chopped onion and brown with the meat for added flavor. You can substitute 20 oz. of frozen spinach for 1 lb. of fresh spinach.